The length of time you spend on the phone prospecting indicates a few key things about you and your business. Your ability to be on the phone 60, 70, or even 90 minutes at one time leads to discipline, focus, and sales. If you can work with high intensity, making one call after the next, and get into a flow and rhythm, you are showing the skill of a quality salesperson. The length of time on the phone equates to “talk time” for the day and each call. Talk time is measured by how long you are on the phone. Most sales calls end fairly quickly — inside a minute. Typically, the prospect delivers a “brush-off” response to get rid of the salesperson. The salesperson either handles it well and elongates the call or the call ends. 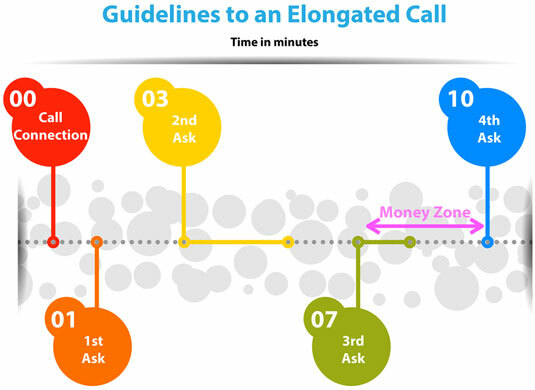 On initial sales calls you want to elongate the call into the 7–10-minute range, which is the money zone. This magic zone ensures that you have enough of a conversation to get information about the prospect and multiple opportunities to close for an appointment. Guidelines for an elongated call. The talk time for each individual call and daily total talk time are indications of success as a salesperson.